Review: This tells the story of two gangsters/criminals Reggie and Ronnie Kray who were based in the East End of London in the 1960’s. 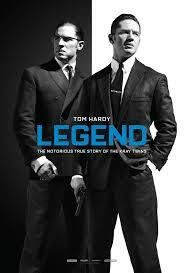 Tom Hardy’s performance in this is one of the best acting I have ever seen him do in a film. How he didn’t even get a Bafta/Oscar Nomination I think is ridiculous. I had high hopes for Tom Hardy. The film to me did seem very long and drawn out. Paul Bettany is in this (uncredited) but only has a small part. A very entertaining film. I thought Emily Browning did a really good job and was really impressed with her acting unlike the film I last watched her in (Summer in February). Tom Hardy and Paul Anderson both co-starred together in the award winning BBC TV series Peaky Blinders (2013). The Kray twins had an older brother named Charlie who died in prison in 2000. Mostly filmed in Limehouse or Waterloo in London.